We have been a partner with 1E for nearly 10 years now and it still staggers us how more organisations don’t innovate using 1E technologies. Acquiring, deploying and managing software and operating systems is an expensive task and the more you can automate, the more you can save. For a change we are going to f ocus specific tools and how they help you with your Windows 10 migration. 1E’s methodology relies on three tools, namely Nomad, Shopping and AppClarity. The approach is to provide zero-touch (100% automated) migration to 90% of the PCs within your organisation. This is important and you need to get your head around this. This is significantly more powerful than 90% automation across the estate (see illustration). That’s because even with 90% of the tasks automated, a complete migration would involve desk side visits to all of the PCs. Total automation of the migration process means a desk side visit is not required in the majority of cases and many more machines can be migrated at the same time. So let’s examine how 1E does this. 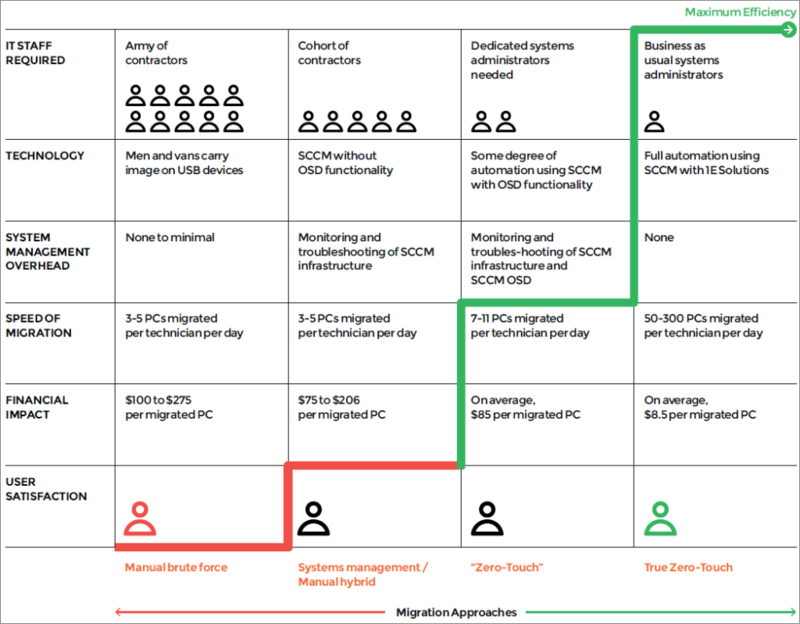 How they automate the process through their tooling and save you significantly during your Windows 10 migration project. If you are going to migrate to a new operating system, one of the important things to plan for ahead of time is ensuring that the OS image is available locally onsite. This is particularly pertinent in large distributed environments. This is where Nomad Enterprise comes into its own. Nomad, can distribute large images, across any network link, with zero impact on business traffic. It does not use BITS, but rather its own bandwidth friendly algorithm that constantly backs off to business traffic. This allows you to get any content anywhere, faster and more efficiently than anything else on the market. And the double benefit is that Nomad does this without remote branch server infrastructure at all. You can get rid of all of your remote distribution points, this yields massive savings in itself. Once the content is there, you obviously want the PC to be available when the Windows 10 Migration kicks off. If the end user has powered the device off you are helpless if you are looking at a zero touch, completely automated solution. Again, 1E has the answer. 1E WakeUp (which is bundled with Nomad) will wake the device up to ensure it is in the correct state to kick off the migration. This class leading tool provides wake on lan capabilities without any network changes required. It just works! As you will know, one of the major headaches with any operating system migration is scheduling. You will normally do this by physical location or department. It becomes a big headache and extra cost if a few of the targeted users are not available or need their PC’s during the allocated time. 1E overcome this challenge with their Shopping tool. Shopping is a user self service store front for the IT department. Part of the solution includes a windows migration scheduling tool. Users can access the website, and schedule when they want their automated migration to take place based on a convenient time to them and their business priorities. Once scheduled, Shopping passes over the deployment to SCCM at the relevant time and the Windows 10 migration commences. 1E’s solution leverages Microsoft’s User State Migration Tool (USMT) within the task sequence, but what do you do with all the data that it produces that needs to be stored during the migration. Nomad helps out here again and does this without any server infrastructure and state migration points. By using a feature within Nomad called Peer Backup Assistant, user data can be backed up to a peer (or many for redundancy purposes) and then copied back over as part of the task sequence. PBA is even intelligent enough to persist this data for a period of time before it gets automatically deleted. This ensures that data is never lost, just in case there is a hiccup during the migration process. As you have seen above, Nomad eliminates the need for remote distribution points for content delivery. But what about operating system deployment and PXE? Yes, you guessed it, 1E have the answer here as well. At the appropriate time, based on the users schedule, the PC will boot into Windows PE (pre-installation environment) from a local, dynamically selected PXE peer. This is another feature within Nomad called PXE everywhere and is delivered without a server. Not only this, 1E can also migrate from BIOS to UEFI and repartition the disk, through a single task sequence. This allows you to enable the enhanced security features within Windows 10 like secure boot and device guard. The Windows 10 image is then installed, again from a dynamically selected local peer. This is no need for a local distribution points or PXE server and no content is being downloaded across the WAN. When doing a Windows 10 migration, time is money and installing applications is both time and licensing costs. Through another 1E tool called AppClarity, 1E assesses which applications are actually being used in the environment. This is done across all vendors and all applications without the need for metering rules. During this process you have the option to install them all or just install those that were actually used. Furthermore, with an Application Mapping utility within Shopping, the solution allows you to map other versions or other products for software which may be different in the migrated environment. Enabling you to replace software during your migration in an automated fashion. Ultimately with 1E’s approach and tooling your are left with 100% automation across 90% of your devices. This means you only need to physically touch 10% of your machines which is a massive cost saving. 1E’s approach is also based on a user centric approach, ensuring the lowest impact and highest user satisfaction as part of the project. The good news is that using this approach, an organisation can make choices that are the most cost and time efficient, but at the same time are also making the choices that meet the needs and expectations of their end users and that ultimately drive high satisfaction and advanced service levels.